In a recent essay in The New York Times’ T Magazine called By Design: The Franchising of Architecture, critic Witold Rybczynski questioned whether globalization has been good for architecture. Has the result been cities populated with buildings designed by “imported architects just passing through town” with little knowledge of the history, climate, or how that particular town works? Do architects design better buildings on their own turf? “Is globalization good for architecture? It’s a conversation very relevant to Calgary right now, as lately we’ve been on a bit of a Starchitect binge. It’s hard to dispute Rybczynski’s argument that to be able to design in a place, you have to know all the nooks and crannies, and experience the location instinctively. Utilizing new technology like google earth has nothing over experiencing a place first-hand and perhaps it is time for some cities to choose local talent over superstars who, like tourists, have only briefly visited. That said, there’s no denying that Calgary’s urban landscape has greatly benefited by the spate of new projects designed by renowned, international architects. Before Calatrava’s Peace Bridge and Foster’s Bow – to name just two – Calgary’s tired skyline needed help. These guys raised the bar and it was necessary. 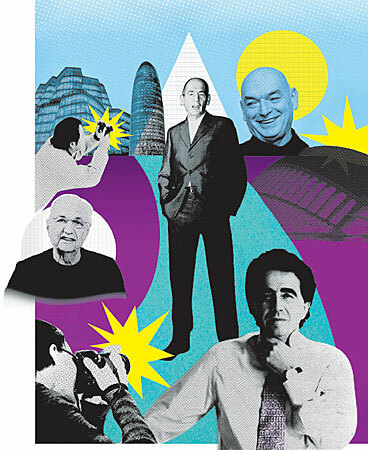 Blog Cover Photo: A roster of celebrity architects: clockwise from center, Rem Koolhaas, Jean Nouvel, Santiago Calatrava and Frank Gehry.